The master of Dutch death-thrash return with a platter of precision and pestilence aimed at taking your head off from across the room. OCCULT are one of those bands that should be legendary (considering they have been plying their trade for over a decade) but for reasons unknown, they remain a cult band. Elegy for the Weak may be the ticket to launch them to the next level. Gone are the female half of the dual male/female vocals and the result is a much more focused and grittier sound that takes no prisoners. Occult are usually heralded as pure thrash metal but to these ears they are a perfect fit for ears who like a lot of death metal infused into their thrash. 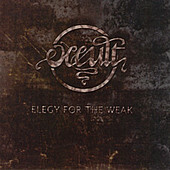 Elegy for the Weak is a piledriving album and nobody with leather eardrums will be disappointed.